Happy New Year! It’s 2015, which means “Back to the Future II” fans can finally see if our reality matches director Robert Zemeckis‘ vision of the future Universal Pictures presented to movie theater audiences in 1989. While cars aren’t zipping through the sky, robots aren’t walking dogs and shoes aren’t tying themselves (yet), the sequel did get a few things right. Flat screen TVs, for example, are now the household norm, and 3D holograms have been making regular appearances on stage since the ghost of Tupac performed alongside Snoop Dogg and Dr. Dre at Coachella in 2012. In fact, the holograms look much better in comparison to that giant “Jaws 19” hologram that chomped down on Marty McFly (Michael J. Fox) as he walked past the Holomax movie theater in the fictional futuristic town of Hill Valley. 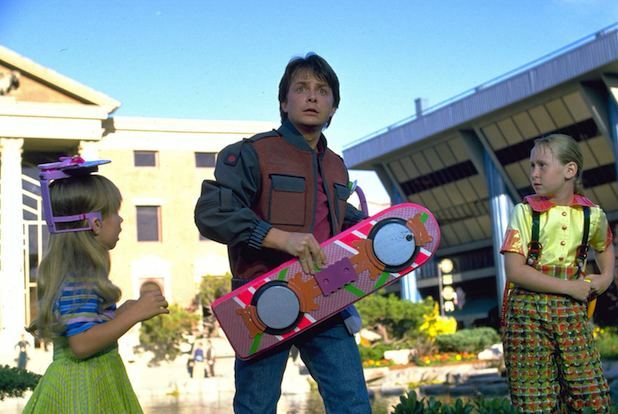 Advances in science have even allowed Marty’s awesome hoverboard to break out of the “fiction” category. Earlier this year, a Kickstarted company named Hendo introduced a prototype that professional skateboarder Tony Hawk rode for real — unlike the hoax he helped Funny or Die pull off. Unfortunately, the first 10 units have already been sold for $10,000 a pop. Good news is that they only work on metal surfaces at the moment, so save your money and wait for the real deal to hit the market. Video conferences, like the one between older Marty and his Japanese boss, have become a regular way to communicate in both our professional and personal lives, thanks to telecommunication companies like Skype and Google. And remember little Elijah Wood‘s role in the movie? The child actor, who went on to lead the cast of Peter Jackson‘s “Lord of the Rings” trilogy, watches Marty shoot his way to victory while playing an arcade game. “You have to use your hands? That’s like a baby’s toy,” Wood’s companion says. Controllers are still prevalent in the video game world, but the Ninendo Wii, Xbox Kinect and Playstation Move have been offering gamers a hands-free alternative for years. Biff’s son, Griff (Thomas F. Wilson), demonstrated the fingertip availability of technology in 2015, to mixed results. Excluding military tech — like exoskeletons that have been in development for decades — no, bullies can’t rely on robotics to augment their strength to pick on a “chicken” like Marty. But they can channel sounds to antagonize their victims, much like Griff’s lackey does when he touches a button on his vest to insult Marty with a chicken cluck sound effect. Any number of apps available for smart phones allow users to play sounds at the touch of their screen. Still, our own vocal chords seem like a more convenient option. Biometric security, as demonstrated by two Hill Valley police officers using Marty’s girlfriend’s thumbprint to return her to her futuristic home, is alive and well today. A fingerprint currently serves as a high-tech alternative to a key, and even replaces a password on the iPhone 6. There were other moments when tasks were completed in the film with the mere touch of a finger, including a taxi transaction on what appears to be a tablet-like device. Apple introduced the iPad in 2010, and every competitor has followed in the company’s footsteps with their own tablets. As the scene with a cab driver correctly predicted, businesses are increasingly taking advantage of the technology to complete transactions. Some restaurants send orders to the kitchen through tablets, and anyone can accept credit with a $10 card reader. Let’s not forget that cash is almost obsolete in taxi transactions, thanks to apps like Uber, Lyft, Sidecar and Curb. In “Back to the Future II,” video glasses are worn by Marty’s children at the dinner table. They can watch up to two screens at a time, as well as send and recieve calls. Thanks to Google, today’s generation of children can do the same thing by wearing Google Glass. The wearable technology with an optical head-mounted display allows users to access much of the same information available on their smart phones in hands-free form — provided users are willing to shell out $1,500 for a pair. After reading all of this, it’s understandable if you’re still hung up on the dearth of flying cars in this day and age. It’s a real bummer. But at least Zemeckis was way off about another prediction: Fax machines. They were still heavily used in “Back to the Future II.” Major advancements in digital communication, however, have all but ensured you’ll never have to use one again — unless you’re an assistant at Sony.